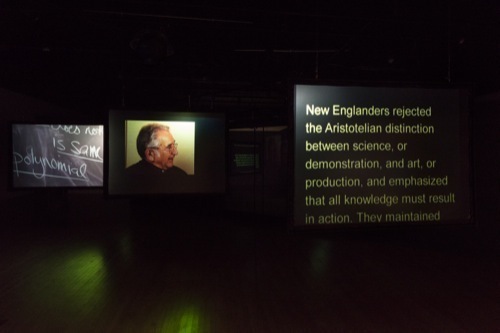 Spanish artist and retired MIT professor Antoni Muntadas’s show, “Activating Artifacts,” includes two three-channel video projections, About Academia I, 2011, and About Academia II, 2017, that index the conditions of higher education in the United States through quotations from educational theorists, snippets of interviews conducted in 2011 and 2017 with liberal professors and students, and looping scenes of campus life—lecture halls full of empty chairs, a closed door with a sign that reads “Computational Materials Meditation Room,” and students in sweatshirts walking to class in the rain. A freestanding thick windowed wall bisects the dark gallery, with the three screens suspended on either side. On one side are edited fragments of the 2011 interviews with well-traveled faculty such as Ute Meta Bauer, Noam Chomsky, and Howard Zinn, as well as with a professor who reported feeling as if he had become less important within his institution when his research didn’t attract funding. On the other side, interviews recorded in 2017 feature recent students—more visibly diverse than their elders—reflecting further on the stresses of institutional intellectual life, among them low-paying part-time work, oppressive architecture, and imperialist attitudes toward diverse communities. Muntadas’s installation might be a warning: If the post-secondary experience as framed here seems to value status, efficiency, routine, and blanket indoctrination over disruption and open philosophical investigation—and if colleges and universities promise hyper-professional careers and bend too much to receive any investment available—it threatens to only transmit the values of certain corporations, governments, and other undifferentiated educational institutions. In this context, Muntadas makes the ubiquitous lecture-hall chair look like a possibly restrictive device; its hinged tablet arm threatens to constrict and confine rather than aid and support.